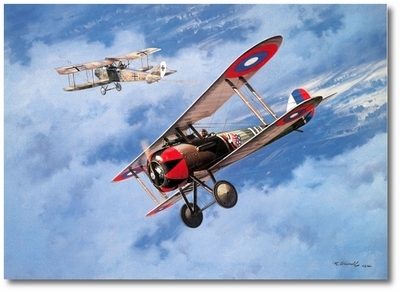 Overall size: 30" x 24"
"Fifth Victory" was co-signed by WWI Ace Douglas Campbell. In April 1917, Campbell dropped out of Harvard University to enlist in the United States Air Service. After learning to fly the Curtiss JN4 "Jenny," he was assigned to the 94th Aero Squadron in France. Campbell and Alan Winslow shared credit for the 94th Aero Squadron's first official victory over an enemy aircraft. Flying the Nieuport 28, Campbell was the first United States Air Service pilot trained in the United States to score five confirmed victories. Scoring his final victory on 5 June 1918, he and James Meissner shot down a Rumpler near Nancy, but Campbell was wounded in the back by an explosive bullet and sent home to recover. 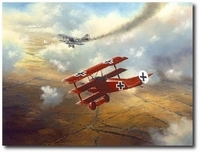 Shown here is his fifth victory, May 31, 1918, over a Rumpler C.